The New England Garden was built in 2006-2007 under the leadership of First Lady Karen Baldacci. In 2006, Pressley Associates, a landscape architectural firm located in Cambridge, Massachusetts, was retained to adapt the 1920 Olmsted Brothers plan to existing site conditions and construction codes while remaining true to the Olmsteds’ original design intent. features a flower display that changes throughout the seasons. Granite benches, located along the perimeter, focus on the central lawn. One bench is dedicated to the memory of E. Chuck Cianchette of Pittsfield, who made possible the construction of the front entrance to the house. An entry landing and stair from the Blaine House Family Dining Room links the home’s interior with the Garden. Plantings in the four central annual beds reflect the changing seasons, with each season exploring the various species’ unique attributes. The annuals are appropriate to the 1920’s when the Garden was designed. The annual beds also feature seasonal standards that complement the surrounding annual display. A Pepper Viburnum is believed to be part of the original plantings. 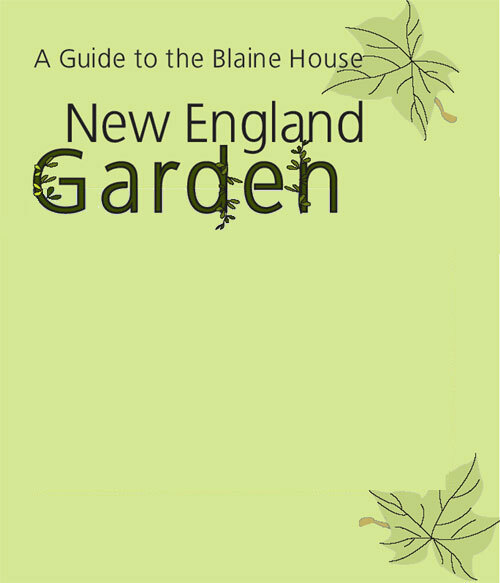 The New England Garden represents the third phase of a 20-year long effort begun under Governor John McKernan in 1987 to repair and restore the Blaine House to its original appearance as the home of Maine governors and their families.